The more passengers traveling together, the greater your savings, so long as the fare for the entire group is paid with one credit card at the same time. For example, the round trip Michigan Flyer fare between East Lansing and Detroit Metro Airport for a group of three adults is $42 per ticket (or $126 total), whereas the fare for one person traveling alone is $54 (or a total of $162 for three people traveling separately. )For groups of 20 or more, please call our office at 517-333-0400 to arrange for even greater savings. 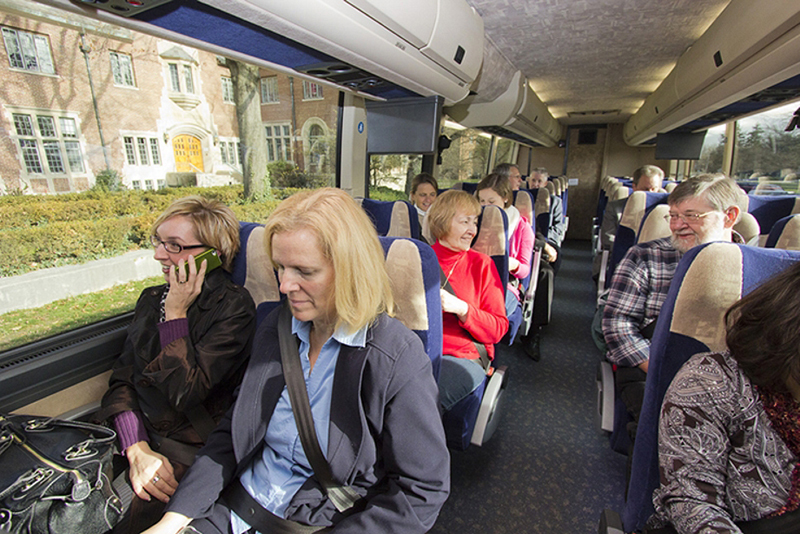 Does your group want to travel somewhere other than East Lansing, Ann Arbor, or Detroit Metro Airport? Then Indian Trails―Michigan Flyer’s parent company―can get you there and back in deluxe-motorcoach style. Indian Trails has extensive experience operating charter and shuttle services for large and small groups. Convention groups, associations, corporations, sporting events, family reunions and even churches have all relied on Indian Trails to transport their groups safely and efficiently. Whether it is a group of 50 or 10,000 people, Indian Trails’ knowledgeable staff will assist you with every phase of planning. Give them a call toll free at 800-292-3831. Or, click here to request a quote online. If you have employees and clients traveling to cities via Detroit Metro Airport, you may qualify for a corporate discount with Michigan Flyer. Even though we already offer significant savings over personal cars (particularly with sky-high airport parking), taxis and limos, we extend further discounts of 5% to 10% to organizations whose employees fly frequently from DTW. To apply for a corporate discount code and discount fares for your employees and clients, just fill out the form here. Within three business days, we will either issue you the code by email or contact you with follow-up questions. We offer two pass programs for employers and employees to encourage the use of mass transportation to protect the environment and save money: The Federal Commuter Choice Program and the Michigan Flyer Pass Program for Employers. Private employers, non-profit organizations and public agencies, federal government employees, and members of the military services are eligible to receive these transit commuter benefits. However, self-employed individuals, partners, 2-percent shareholders of S corporations, sole proprietors and other independent contractors are not eligible under IRS rules. The most attractive option to employees is for the employer to cover the full cost of the transit benefit up to $230 per month. The cost for the employer is tax-free and deductible as a business expense. Employers may permit their employees to have up to $230 per month deducted from their current monthly pay towards the actual cost of public transit before taxes are applied. Employers can share the cost of transit with employees, and everyone can receive valuable tax savings. Benefits: Employers and employees save on federal taxes―a nice, affordable fringe benefit. Employees arrive at work relaxed and refreshed because they avoid the stress of rush-hour driving. Choosing public transit reduces carbon dioxide emissions, and makes companies more attractive as socially responsible employers. [Footnote] * Section 132 in the Internal Revenue Code, Title 26 of the United States Code, as modified by the Taxpayer Relief Act of 1997 and the Transportation Equality Act for the 21st Century. Any employer with 10 employees or more is eligible to participate in the Pass Program for Employers by entering into a monthly contract with Michigan Flyer and purchasing unlimited access passes for each employee at the rate of $350 per pass per month, depending on the boarding points and number of employees involved.